Hos Dorte: Tracey's Sketch, DT card for FFF. sketch for you to follow. of some of Roberta's cute images. She has lately created a lot of new Gillian and Lewis images. Visit the shop and check them out. I'm sure you will find them irresistible. I have used "Singin in the Rain" for my card. best here in Norway this summer. So I found the image perfect! The papers are from Bo Bonny, I like the colours. with my retro punch and added pearls. I put on Glossy Accents on Gillian's glasses and on the water. "Age is like climbing a mountain. You'll be out of breath, but the view is magnificent!" The back side with elements from the front. And my personal stamp of course. Beautiful card Dorte...great colouring of Gillian...pretty papers, ribbon and flowers...have a nice weekend! Beautiful Dorte, the colors are gorgeous with this sweet image. Thanks for sharing your adorable creation with us at Scrap-Creations. 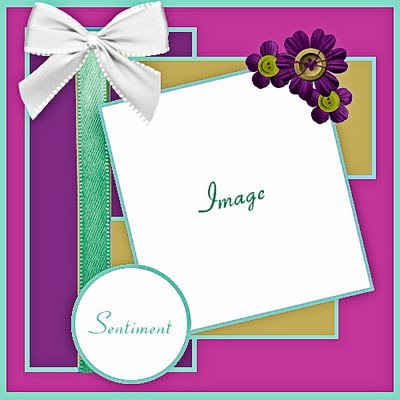 Lovely colours on your sweet card!! This is gorgeous I love the image & the papers are fabulous. Thanks for joining us girlies over at CES Challenges, good luck. Så søtt kort! Og så stilig det ble med de lange båndenen på sløyfa. This is so, so pretty! I love the papers! 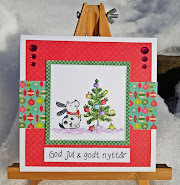 Beautiful card Dorte - love the colours...and that image is so cute! Nydelig og fargerikt kort. Herlig motiv! Likte veldig godt bruken av bånd :) Supert! Your card is gorgeous!! I love the color combo. Great card. So lovely put together with all the great embellishments. 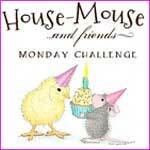 Thank you so much for joining us at Bearly Mine Challenge this time. Hope to see you next time again :). Good luck! Wow, such a fantastic creation! Really love the color combo!